A robotic system of three distributed, collaborating robot was successfully able to fetch coffee from the chair's kitchen and delivered it to room 4304. The following video shows how the three robots interact to deliver coffee to an office. 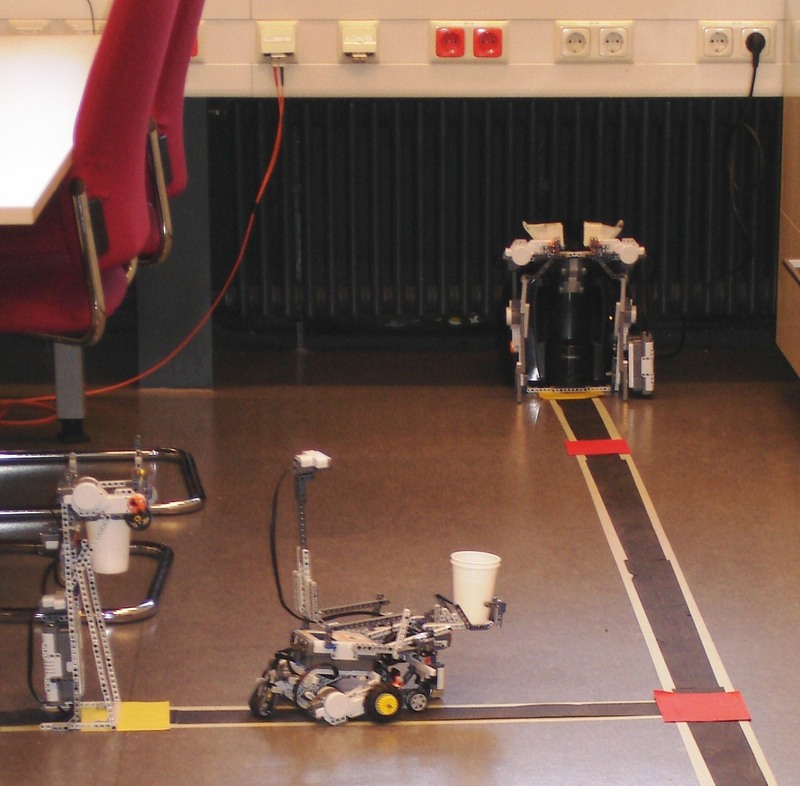 The floor markings were necessary due to hardware restrictions imposed by the Lego Mindstorms sensors. The topic of this lab class is the model-based development of robotics applications. 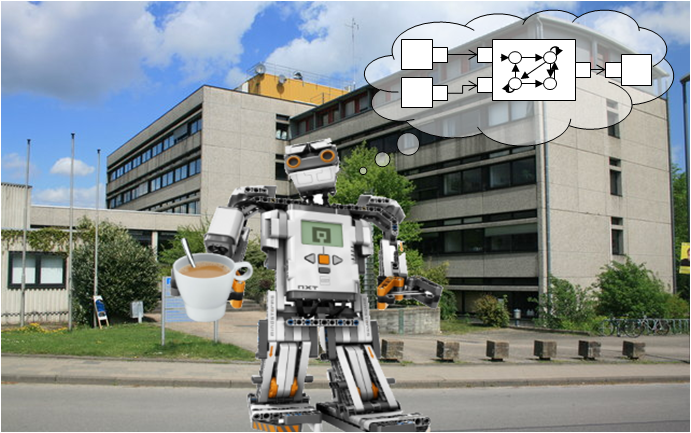 Your aim will be to develop a vital coffee service robot using predefined modelling languages for both behavior and archtiecture, Java, and Lego Mindstorms. 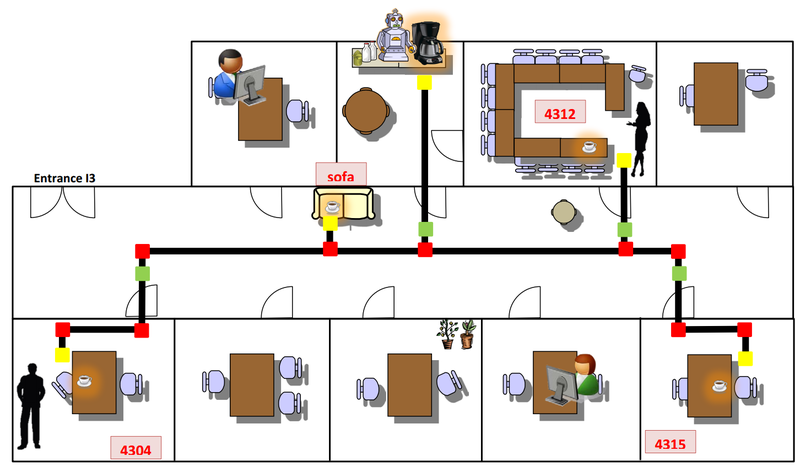 Therefore, the lab will be divided into at least two groups, which independently model, construct, implement, and evaluate their respective coffee service robot and the respective code generators. leJOS or ROS to connect your code to the Lego Mindstorms Education Kit robots. Registration period starts 18.06.2012 and ends 01.07.2012. Applications are directed to and assgined by the course guidance center. Will be anounced later on. The lab course consists of regular meetings and a final presentation. 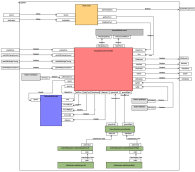 RWTH Aachen University, Technical Report. Aachener Informatik-Berichte, Software Engineering Band 11. 2012.